Here is a triad arpeggio exercise that spans 13 frets and uses all 6 strings. It is an excellent workout for both hands and it will help you visualize more clearly how a chord can be spread over the fretboard. Written are the triads F Major (F-A-C), F Minor (F-Ab-C), F Diminished (F-Ab-Cb), F Augmented (F-A-C#) and F Suspended 4 (F-Bb-C) Play them with alternate picking. These arpeggios should be practiced in all positions. Following the cycle of fourths can be useful here. Play each of the four arpeggios off the following notes (in the order written): C,F,Bb,Eb,Ab,Db,Gb,B,E,A,D,G. If you can’t complete an arpeggio due to lack of frets, simply go as far as your fretboard will allow. This exercise should be practiced with a metronome at a comfortable tempo. Coordination first. Then speed. Good luck! 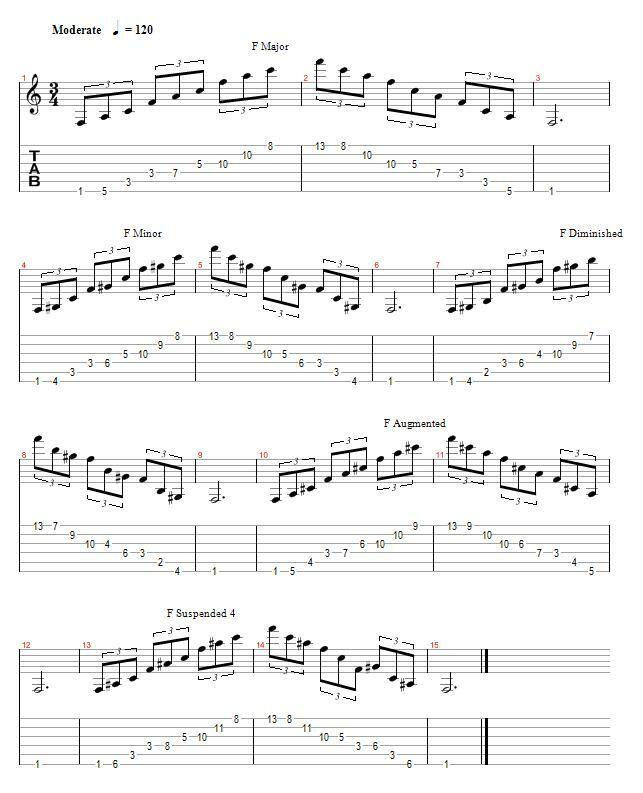 This article was originally published on Infinite Guitar in 2007 for the Triad Arpeggios lesson.